The Utility Maximum Achievable Control Technology (Utility MACT) rule, most recently called the Mercury and Air Toxics Standards (MATS), is a regulation proposed by EPA that will restrict the ways power plants produce electricity across the nation. It was finalized on December 16, 2011, and will place limits on the emissions generated by coal fired electric generating units. Earlier in the year, the agency also finalized a rule that will require states to reduce power plant emissions further. 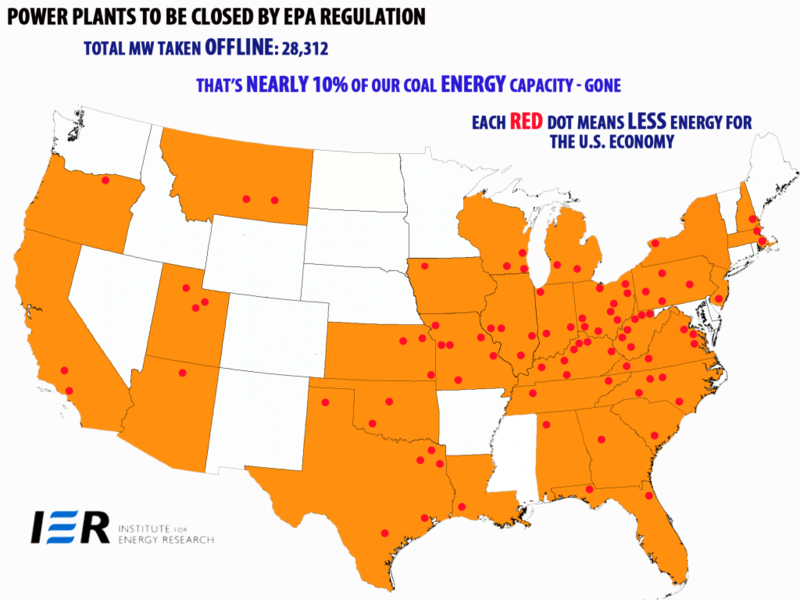 That rule—called the Cross State Air Pollution Rule (CSAPR)—was finalized in June 2011. Implementation of Utility MACT and CSAPR is conservatively estimated to cost over $13 billion in the year 2015 alone. What are the Costs of These Regulations? These regulations, which are only a handful of many that apply to power plants, will have the combined effect of making it prohibitively expensive to run a coal-fired power plant in the United States. In fact, this very scenario was first forecasted by President Obama, who said in 2008 that under his proposed air quality regulations, “if somebody wants to build a coal-power plant, they can. It’s just that it will bankrupt them.” The bulk of the costs associated with making electricity generation more expensive, however, are ultimately borne by the consumer. Utility MACT alone will be one of the most expensive rules the agency has ever issued for the power generating sector, expected by EPA to cost $10.9 billion in the year 2015; $10.1 billion in 2020; and $10 billion in 2030. However, an analysis by the National Economic Research Associates (NERA) estimates annualized compliance costs will be $17.8 billion. In its cost-benefit analysis, EPA forecasts that utilities will need 30 to 40 years to pay off the costs of complying with Utility MACT—costs that will undoubtedly come in the form of higher electricity rates. In the case of CSAPR, the details of which states were only informed of six-months’ prior to its effective date, virtually every plant east of the Mississippi River will be affected. EPA’s extremely conservative modeling estimates that implementing the rule could cost up to $800 million annually with $1.6 billion per year in additional capital investments, for a total of $2.6 billion per year by 2014. According NERA’s study, Utility MACT and CSAPR could increase the average electricity bill by 11.5 percent. 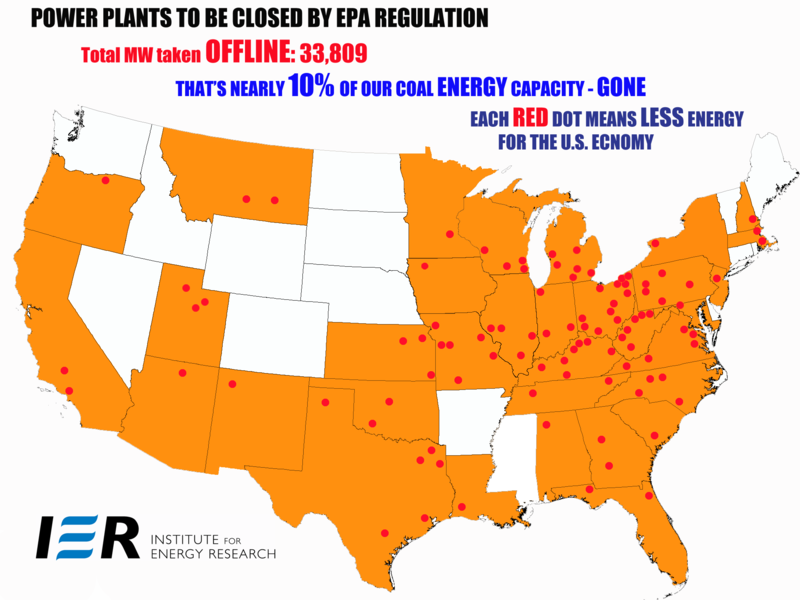 Moreover, although EPA claims that the rule will create 31,000 short-term construction jobs and 9,000 long-term utility jobs, the combined impact of Utility MACT and CSAPR could result in the loss of over 1.4 million job-years by 2020. According to EPA’s own data, the quality of our nation’s air is better today than at any point in the past 40 years—despite the fact that we have more people using more electricity and driving more cars. Since 1970, GDP has more than doubled, vehicle miles traveled have increased by 170 percent and aggregate emissions of pollution have fallen by 71 percent. In the case of Utility MACT, the air toxics emissions targeted by the rule have already been decreased by 42 percent from 1990 to 2005 and mercury emissions have decreased more than 45 percent since 1990. The emissions targeted by CSAPR have fallen even greater amounts since 1990: 67 percent for particulate matter; 65 percent for sulfur dioxide; and 48 percent for nitrogen oxide. Furthermore, although EPA’s public efforts focus much on the impact mercury has on children, its modeling of the benefits of preventing premature deaths are set up to accrue to individuals at an average age of 80, who would like just weeks or months longer, if at all, because of the regulation. The agency’s cost-benefit analysis has further problems in linking the intended effect of the regulation with the cost savings it allegedly produces. For example, though the Utility MACT rule is intended to reduce mercury and air toxics, it derives 99.9 percent of its total estimates of $140 billion in health benefits to reducing fine particulate matter as a “co-benefit.” This is only a side-effect of the required controls, and paints a disingenuous picture of what the regulation will actually accomplish. President Obama talking to the editorial board of the San Francisco Examiner, Jan. 17, 2008. http://www.youtube.com/watch?v=DpTIhyMa-Nw&feature=youtu.be&t=2m15s. Institute for Energy Research, “Hard Facts: An Energy Primer,” http://www.instituteforenergyresearch.org/hardfacts-uploads/NJI_IER_HardFacts_ALLpages_20120423_v8.pdf , pg 11. 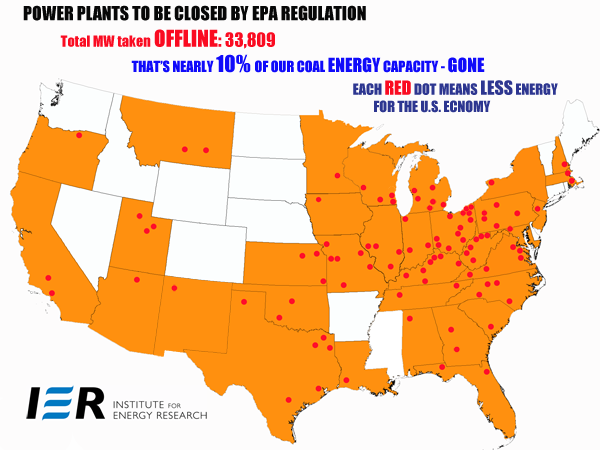 Institute for Energy Research, “Impact of EPA’s Regulatory Assault on Power Plants,” April 19, 2012, http://www.instituteforenergyresearch.org/epa-powerplant-closures/. Enivironmental Protection Agency, “Regulatory Impact Analysis of the Proprosed Toxics Rule: Final Report,” March 2011, pg. 8-12. National Economic Research Associates, “Proposed CATR + MACT Draft Report,” http://www.eenews.net/assets/2011/06/08/document_gw_04.pdf. Environmental Protection Agency, “Presentation on the Cross State Air Pollution Rule,” http://www.epa.gov/airtransport/pdfs/CSAPRPresentation.pdf. Environmental Protection Agency, “Air Quality Trends,” http://www.epa.gov/airtrends/aqtrends.html. Environmental Protection Agency, “Roadmap for Mercury,” http://www.epa.gov/hg/executivesummary.htm. NERA Economic Consulting, “Technical Comments on the Regulatory Impact Analysis Supporting EPA’s Proposed Rule for Utility MACT and Revised NSPS,” August 2011, http://www.nera.com/nera-files/PUB_Smith_EPA_report_0811.pdf, pg. 1. Dudley, Susan, “EPA’s risks outweigh rewards for new mercury rule,” The Hill, December 20, 2011. http://thehill.com/blogs/congress-blog/energy-a-environment/200539-epas-risks-outweigh-rewards-for-new-mercury-rule.